We have now moved past the halfway point in the year and just celebrated Independence Day. Hopefully, you survived the 4th with all of your digits intact. Hands and fingers tend to be the most injured body parts and not surprisingly men in the 25 – 44 age range are the most commonly injured. Statistically, the number of injuries is quite low. Out of the 254.4 million pounds of fireworks consumed, there were only 12,800 injuries in 2017 or 5 injuries per 100,000 pounds of fireworks. Flares have taken a toll on the stock market. Escalating trade disputes/tariffs, as well as increasing interest rates, have put a damper on the markets. Despite the lackluster returns year-to-date, it could be worse. The economy appears to be marching forward and in some areas accelerating. If the economy was not doing so well, the trade disputes and interest rate hikes would have severed a few fingers already. As we enter the second half of the year, with all of the issues/concerns hitting the news, we are happy to have all ten fingers. The United States posted positive results in the second quarter, besting the emerging and international markets. The second quarter put the US market at even (flat) for the year. Emerging markets took the brunt of the trade war. Countries such as Brazil, China, Pakistan, Philippines, and Turkey are down close to 20% which is considered a bear market. The tariffs and worries about an all-out trade war have not (so far) hurt consumer and business confidence in the U.S.
Business confidence along with the new tax deal has led many companies to repatriate overseas profits. JP Morgan reported that about 10% of the roughly $2 trillion in overseas profits have come back to the U.S. 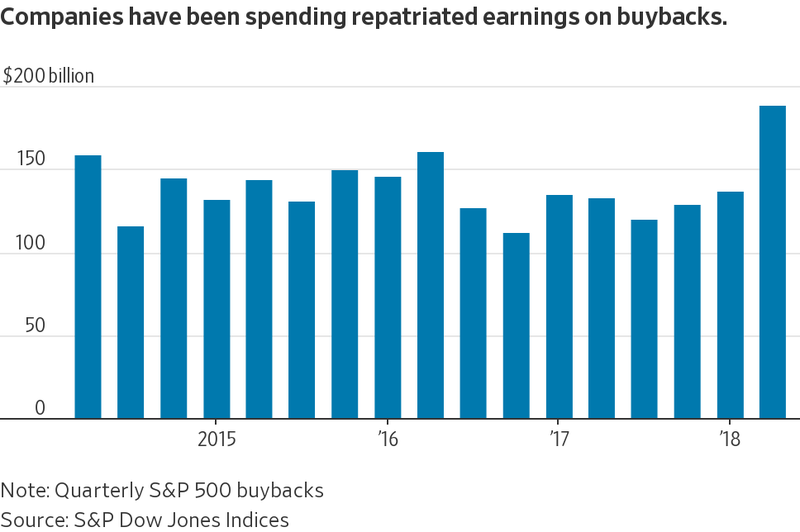 Some of that money has been used for share buybacks and this could be seen as a positive or a negative. It is great they are repatriating dollars, but are they propping up earnings with a reduction of shares outstanding? 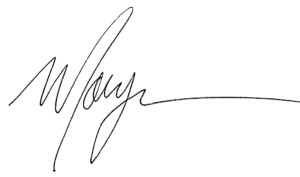 If a company earns $300,000 on 1,000,000 shares, their per-share earnings is $0.30. The following quarter they earn $280,000 on (a now reduce share amount) 900,000, they are now earning $0.31 a share. The good news is that 10% is only a sliver of what could be coming back to our shores. Companies could decide to pay dividends or use it to purchase equipment to expand earnings, all positives for stocks. As shown below, there is a theme to the returns in the last quarter. International and emerging markets took the largest hit from the tariff rhetoric. Small cap stocks (Russell 2000) performed nicely as those companies tend to derive their earnings domestically, hence, tariffs should not hit them as hard (if at all). The top prize went to the REIT space. REIT’s tend to pull back when rates are moving up and they did not fare well at the beginning of the year. Last quarter’s reversal helped REIT’s post positive returns for the year. Oil was the winner as far as commodities, bolstered by a few large producers being offline. Soybeans and corn were hit hard as they were at the top of China’s retaliatory tariff list. Like they say; one thing about them tables…they are always turning. Interest rates increased mildly in the second quarter. The 10-year note rose 11 basis points to 2.85% while the 30-year bond inched up 1 basis point to 2.98%. The Fed should have additional bumps in the overnight this year. The Fed’s June meeting notes were released, and they also have tariffs on their minds, although they did note that trade is much more important to China than the US. The US continues to be the “cleanest dirty shirt” when it comes to interest rates. 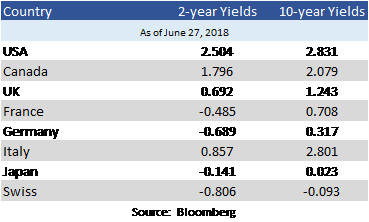 As you will see below, only Canada came close to our yields. As of June 27th, there are a few countries that have negative yields, meaning you receive less back at the end. 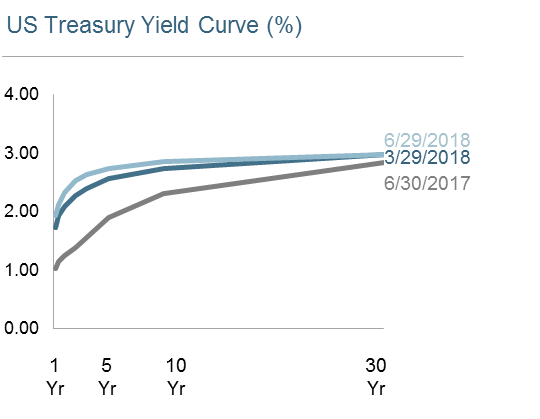 The U.S. yield curve continues to flatten as short and long-term rates come closer to parity. Despite the recent volatility and pull back in the international markets, we do not believe we are at the beginning of a more severe retrenchment. The trade dispute will continue to move markets and we hope there is a resolution, which should push markets higher. Coming down the pike is the midterm elections, so volatility will continue. Our accounts are well diversified with many different asset classes allowing us to participate broadly. 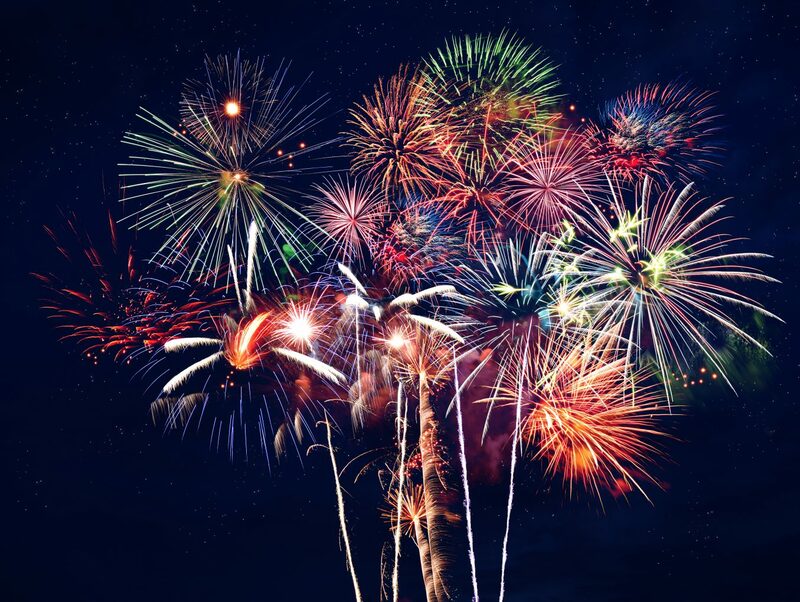 The American Pyrotechnics Association says to, “remember the consumer products necessary to experience these traditions must be always used wisely and with care.” We will continue to deploy your assets wisely and with a tremendous amount of care. We are happy to announce that Jaril Tudio has joined Spinnaker Investment Group, LLC as an Insurance Consultant. 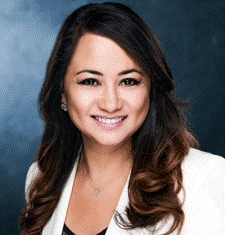 Jaril is an insurance professional specializing in life insurance and long-term care. Jaril was most recently employed with New York Life Insurance, where she worked for 5 years achieving the Million Dollar Round Table. When not spending time with her family, Jaril is serving the community where her passion involves advocacy for children’s education and development. *Past performance is not a guarantee of future results. Indices are not available for direct investment. Index performance does not reflect the expenses associated with the management of an actual portfolio. Market segment (index representation) as follows: US Stock Market (Russell 3000 Index), International Developed Stocks (MSCI World ex USA Index [net div. ]), Emerging Markets (MSCI Emerging Markets Index [net div. ]), Global Real Estate (S&P Global REIT Index [net div. ]), US Bond Market (Bloomberg Barclays US Aggregate Bond Index), and Global Bond Market ex US (Bloomberg Barclays Global Aggregate ex-USD Bond Index [hedged to USD]). S&P data © 2018 S&P Dow Jones Indices LLC, a division of S&P Global. All rights reserved. Frank Russell Company is the source and owner of the trademarks, service marks, and copyrights related to the Russell Indexes. MSCI data © MSCI 2018, all rights reserved. Bloomberg Barclays data provided by Bloomberg. FTSE fixed income © 2018 FTSE Fixed Income LLC, all rights reserved. The S&P data is provided by Standard & Poor’s Index Services Group. Frank Russell Company is the source and owner of the trademarks, service marks, and copyrights related to the Russell Indexes. MSCI data © MSCI 2018, all rights reserved. Dow Jones data © 2018 S&P Dow Jones Indices LLC, a division of S&P Global. All rights reserved. S&P data © 2018 S&P Dow Jones Indices LLC, a division of S&P Global. All rights reserved. Bloomberg Barclays data provided by Bloomberg. Treasury bills © Stocks, Bonds, Bills, and Inflation Yearbook™, Ibbotson Associates, Chicago (annually updated work by Roger G. Ibbotson and Rex A. Sinquefield). Commodities returns represent the return of the Bloomberg Commodity Total Return Index. 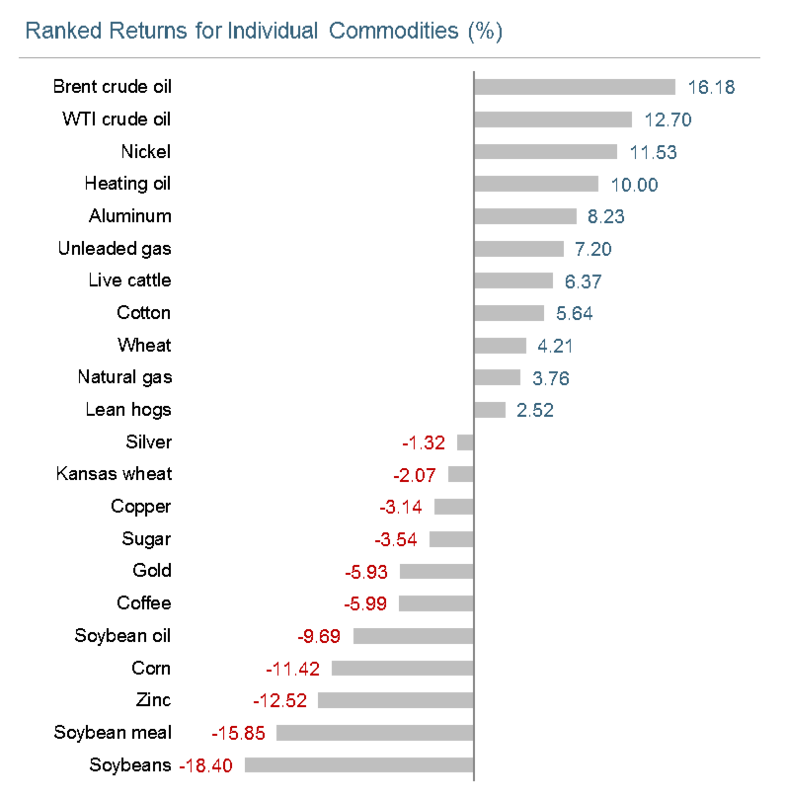 Individual commodities are sub-index values of the Bloomberg Commodity Total Return Index. Data provided by Bloomberg. One basis point equals 0.01%. Yield curve data from Federal Reserve. World interest rates source Bloomberg. Repatriation chart S&P Dow Jones was the source. Diversification neither assures a profit nor guarantees against loss in a declining market. The information contained herein is based on internal research derived from various sources and does not purport to be statements of all material facts relating to the securities mentioned. The information contained herein, while not guaranteed as to the accuracy or completeness, has been obtained from sources we believe to be reliable. Opinions expressed herein are subject to change without notice.